which I wrote in collaboration with my highly regarded colleague Holger Stumm. The book covers the whole range of security topics relevant for your SAP landscape - starting from low-level network / hardware attacks to highly sophisticated APTs (advanced persistent threats). It provides you with all the information, which you need to make sustainable decisions concerning your company's IT security roadmap. Learn about attack vectors and suitable protections, system hardening, network- and RFC-security as well as application server- and database-protection; finally the book also provides helpful guidance on authorizations according to the need-to-know principle. ... and here's a (German) reading sample (PDF). 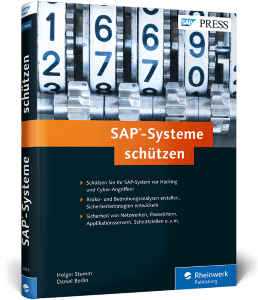 In 2015 I wrote an article for a well-known magazine published by the German-language SAP users group (DSAG). It deals with STAUTHTRACE - an advanced authorization trace in current SAP releases. I've posted an English translation of the article here on my blog: Authorization trace with comfort function: STAUTHTRACE. The German original can be found on blaupause.dsag.de.